Stay tuned! Additional events will be added as we approach Reunions. In the spirit of our IT’S A ‘01DERFUL LIFE theme, the Class of 2001 is encouraging its members and fellow Princetonians to consider what they’re grateful for in their lives. Libraries are certainly places we’ve all benefited from, and so we’re holding a book drive and raising funds to benefit Homefront New Jersey. 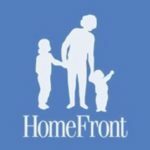 Homefront is a central New Jersey organization helping local families break the cycle of poverty through a variety of initiatives, and has recently built a library whose shelves are waiting to be filled. Fans of the movie and our inspiration IT’S A WONDERFUL LIFE will note that George Bailey’s sweetheart Mary Hatch ends up as a librarian in her alternate life, which to us could be a wonderful fate! Please donate on the Eventbrite registration site (scroll to the bottom of the ticket options) and bring books for all ages to the 15th Reunion registration area in Wilson Courtyard. We will also be accepting monetary donations at the 15th Reunion registration area. If you are logged into Eventbrite, you may not be able to make a donation after registering for Reunions. Please log out of your Eventbrite account before clicking on “GET TICKETS.” Scroll to the bottom of the ticket selection to locate the donation option. Registration for our 15th Reunion is upon us! As always, we will perform registration in waves. See below for the anticipated schedule. Reminder emails will be sent out in advance of each round, but we encourage everyone to register early as registration prices increase with each wave and on-campus housing is limited!!! We will be using Eventbrite for registration processing and payment this year. Please click here to be taken to the registration site. You will be prompted for a password which can be found in the registration-specific emails from the Reunions Team. You will notice multiple ticket options (Classmate, Guest, Kids, Housing). You may select and purchase the appropriate number of each type of ticket for you and your family. The fee structure for the 15th is as follows. The fee includes all weekend activities, bands and DJs, class meals, unlimited beverages and your costume. Housing will be charged separately. * Please note that costumes are not available for children under the age of 2. Your registration fee covers class meals for three days, unlimited drinks, costumes (pending availability so register early!) and entertainment for the entire weekend, as well as paying for the student crew. We have done our best to keep costs down while still ensuring a fun weekend for everyone. We have kept our prices below last year’s 15th Reunion prices! Does my registration fee include housing? We have purchased a limited number of (1) On-Campus beds and (2) Princeton Theological Seminary beds. Classmates will be able to request up to TWO beds (first-come, first-served) when registration opens. Assuming beds are remaining when you register, you will see the two housing choices as ticket options when you register on the Eventbrite site. You can purchase the housing ticket option of your choice along with your registration tickets. Note that On-campus / Seminary housing is very limited and we encourage you to book hotels / Airbnb / etc. if you want to be guaranteed housing. See website for hotels with special deals for the class of ’01. 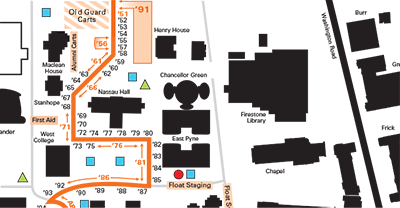 Please see the Reunions Housing section of the Class of 2001 website for all the details. If I cancel or revise my registration, can I receive a refund? Significant expense is incurred based on the expected number of attendees. As such, the following refund policy has no exceptions. Registration fees are fully refundable prior to March 1, 2016. Registration fees are 75% refundable between March 1 and April 15, 2016. NO REGISTRATION FEES WILL BE REFUNDED AFTER APRIL 15, 2016. Note that Housing fees are NON-REFUNDABLE, but if you are unable to attend you may designate another classmate to use any beds you have reserved. Can I make changes to my registration after it has been completed? Yes. You can re-enter the site to add additional tickets (e.g., to register a guest or child) or to revise an existing registration (e.g., to update costume size information) any time before May 1, 2016. The system will accept payment for any additional charges. Note that changes resulting in new ticket purchases will be at the prices of the wave at the time of current purchase. What if I can’t afford to come to Reunions? The Class wants as many classmates as possible to return to campus for reunions. On the Eventbrite registration page, Classmates have the option to contribute to a class financial assistance fund. If you are in need of assistance in order to attend reunions, please contact [email protected] by March 15, preferably sooner. If you have already submitted a request, there is no need to resubmit it. The registration team will contact you if additional information is needed. If you would like to donate to the fund, please do so during registration or go back into the registration system and make a donation. Only requests received by March 15, 2016 will be considered. All requests will be considered after March 15 (it is not first-come, first-served) once the amount of available funds is determined. Notification of assistance decisions will occur by April 1, 2016. All requests for support will be held in confidence and only be seen and considered by the registration team. In your request, please specify the reasons for your request and how much support is needed. Support will only be provided for registration and housing, not travel or other expenses. There is no guarantee the class will be able to assist all classmates who apply or that all fees will be covered. There is a limited pool of funding. Financial support for Classmate attendance will be the top priority, before supporting spouses or children. What do I do if my spouse/partner/guest is a member of another class? If your guest chooses to register through the Class of 2001, then s/he will have access to every part of the 15th reunion activities including meals and costumes (pending availability). If your guest registers through his or her class, then s/he will not receive a costume or be able to attend Class of 2001 meals. I can't make it for all of Reunions. Can I register for just one or two of the days? The Class wants as many classmates as possible to return to campus for Reunions, so we look forward to seeing you any day that you can make it! Unfortunately, it is not possible to offer a prorated registration price based on the number of days you can attend. If you have any questions about registration, please contact [email protected]. The class will have approximately 155 beds available for classmates in on–campus dorms, at a cost of $129 for the weekend. Classmates will be able to request up to TWO beds (first-come, first-served) when registration opens. We have a very limited number of on-campus beds, so please do not reserve more beds than the number of people you register. Please note that classmates who pre-paid class dues for 5 years in 2011 have housing preference for on-campus (and Seminary) beds and there may be no or few beds available after classmates with housing preference have selected their beds. Beds will be in various room configurations (singles, doubles, quads, etc.) and specific room types can be requested, but not guaranteed since we are given a set pool of room types from the University. Rooms will not have air conditioning. The class has reserved 75 beds at the Princeton Theological Seminary, at a cost of $155 per bed for the weekend. Rooms are a mix of singles with one twin bed and doubles with two twin beds. The double rooms consist of two connected rooms, each with a twin XL bed. Please note there is no door between the two rooms. Classmates will be able to request up to TWO beds (first-come, first-served) when registration opens. We have a very limited number of on-campus beds, so please do not reserve more beds than the number of people you register. Please note that classmates who pre-paid class dues for 5 years in 2011 have housing preference for Seminary (and on-campus) beds and there may be no or few beds available after classmates with housing preference have selected their beds. All Seminary rooms are air conditioned. The University Reunions Shuttle serves 20 local hotels. The Class of 2001 has reserved room blocks at the following hotels (all on the shuttle route.) Most hotels only have 5-20 rooms allotted for our room block, so please book early. Note: All information is provided as a convenience for classmates. Please confirm all reservation terms before booking. Cancellation Terms: Reservation must be cancelled at least two weeks in advance. King: $389 per night, plus taxes and fees. Rates available 5/25-5/30. Two Queens: $399 per night, plus taxes and fees. Rates available 5/25-5/30. Cancellation Terms: Reservations must be held by a credit card or accompanied by a first night room deposit. A nonrefundable advance payment for the full stay will be charged on April 28, 2016. Rooms: Single king or two queens room: $329 per night, plus taxes and fees. Includes breakfast for 2 guests. Indoor pool available. Book By Date: March 1st, 2016. Cancellation Terms: Reservations can be cancelled prior to 60 days prior to arrival, without penalty. Cancellations 60-31 days before arrival will be charged one night. Reservations are non-refundable within 30 days of arrival. PLEASE NOTE that cancellation terms on the hotel website are incorrect and the terms above apply to stays over this period. To Book: Use this link. Or call reservations at 609-936-4200 or 855-765-8708 and reference “Princeton University Class of 2001” for the group rate. Minimum stay: 2 nights for Friday check-ins. No Saturday only reservations. Cancellation terms: Any reservations cancelled within 30 days of the arrival date are non-refundable and non-cancellable. Rooms: King: $289 per night, plus taxes and fees. All rooms include breakfast. Minimum Stay: 3 nights. Additional room nights prior to May 26 can be booked for a reduced rate. Cancellation Terms: No changes or cancellations after March 31, 2016. A credit card will be charged on April 1, 2016 for the full stay. Cancellation Terms: Reservations can be cancelled 60 days prior to arrival without penalty. Reservations cancelled 60-31 days prior to arrival will be subject to a cancellation fee of one night’s room and tax. Reservations cancelled within 30 days of arrival are subject to the full charge of the entire reserved stay. PLEASE NOTE that cancellation terms on the hotel website are incorrect and the terms above apply to stays over this period. Rooms: One queen or two queens / standards: $299 per night, plus taxes and fees. Includes hot breakfast buffet for 2, with $10 additional charge for extra people. Cancellation Terms: Rooms may be cancelled more than 14 days prior to arrival. Cancellations within 14 days of arrival will be charged the first night’s stay plus tax. Queen studio: $369 per night, plus taxes and fees. Includes hot breakfast buffet. King Suite: $379 per night, plus taxes and fees. Includes hot breakfast buffet. 2-Queen Suite, $389 per night, plus taxes and fees. Includes hot breakfast buffet. Cancellation Terms: No cancellations or refunds after April 11, 2016. Advanced deposit will be charged for entire stay on April 12, 2016. Cancellation Terms: Reservations are non-refundable and non-changeable as of February 1, 2016. Prepayment for the full reservation will be charged on February 1, 2016. Visit www.hyattplaceprinceton.com and enter the corporate / group # G-PU01. Cancellation Terms: Reservations will be charged in full at time of reservation and are non-cancellable and non-changeable. Call the hotel at 609-734-4080 and reference “Princeton University Class of 2001” for the group rate. Studio (1 Queen, 1 full-sized sofabed): $359/night, plus taxes and fees. All rooms feature fully equipped kitchens and complimentary breakfast buffet daily. Single Bedroom Suites (1 Queen in bedroom, 1 full-sized sofabed in living room): $369/night, plus taxes and fees. All rooms feature fully equipped kitchens and complimentary breakfast buffet daily. Cancellation Terms: Any reservations cancelled within 60 days of arrival are non-refundable. Reservations charged in full on March 28, 2016. One-bedroom suite (Queen Bed with sleeper sofa): $259 per night, plus taxes and fees. One-Bedroom suite (2 Double Beds with sleeper sofa): $279 per night, plus taxes and fees. Minimum Stay: 3 nights. Rates available 5/25-5/30. Cancellation Terms: Pre-pay at time of reservation, reservations are cancelable up to 60 days prior to arrival date. One Bedroom Suite (One King with Sleeper Sofa): $229 per night, plus taxes and fees (extra person charge of $10 for more than 2 people). All suites have full kitchens. Two Bedroom, Two Bathroom Suite (One King and One Queen with a Sleeper Sofa): $299 per night, plus taxes and fees (extra person charge of $10 for more than 4 people). All suites have full kitchens. Cancellation Terms: Cancellations received within 24 hours prior to arrival will be charged one night’s room and tax. Please confirm terms with hotel. Cancellation terms: Reservations are non-refundable. Call the Westin toll-free number at 800-Westin-1, ask for the Westin Princeton at Forrestal Village, and reference “Princeton University Class of 2001” for the group rate.